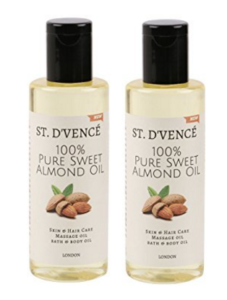 ST. D’VENCÉ 100% Pure Sweet Almond Coldpressed Carrier Oil (Almond oil, 100ml, Pack of 2) acts as a skin moisturizer and for all other skin usage like removing acne, sunburn, tan, black circles and for hair usage to stimulate hair growth etc. Buy the product worth Rs.798 at Rs.349 only at Amazon. It’s formulated & designed by St. D’vencé in London. Manufactured in India under the Make In India initiative.